CNET Australia - App of the day! 05/11/2012 "The questions are actually pretty good, and we like the way the gameplay is put together"
Most trivia games about Australia are boring, but "How Aussie are you?" takes a fun twist to it! 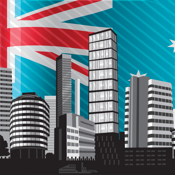 Australia has amazing cities and a great culture, but how much do you know about it? How about learning about it in a fun, addictive trivia game? "How Aussie are you?" is an awesome quiz game testing your knowledge of the country. Targeted for tourists, international students, newcomers, coming to Australia and all Aussies! 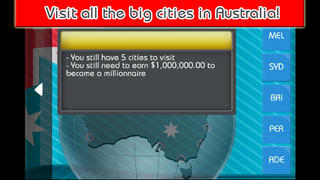 The purpose of the game of is earn ★$1,000,000★ by answering trivia questions about Australia! Don't know the answer? Post the question on Twitter and if somebody replies to your tweet, the answers will be displayed real time on the twitter screen! Nobody replied to your tweet? Use the Hide One button and one wrong answer will be hidden!! Looks amazing on the new iPad retina! Go through the 5 biggest cities in Australia including Melbourne, Sydney, Brisbane, Perth and Adelaide and after every 4 questions about the city, you will have to select a category among 6 (Slang, Sports, Culture, Politics, Geography and History). Then you will have 30 seconds to answers as many questions as you can and you will earn money for every correct answer. (the amount depends on the level of difficulty, easy for tourists, hard for Aussies). Once you completed all the cities, if you manage to earn $1,000,000 you will have to go through the Blitz Trivia (1 minute - 30 questions) to unlock the vault and get your money!